The Aqua Star at the Beverly Hilton, even today, is the largest swimming pool anywhere in Beverly Hills. And this is in a town where having a swimming pool, one sizeable enough to entertain comfortably in and around, is as standard to any house beautiful as staff quarters and a three-car garage. 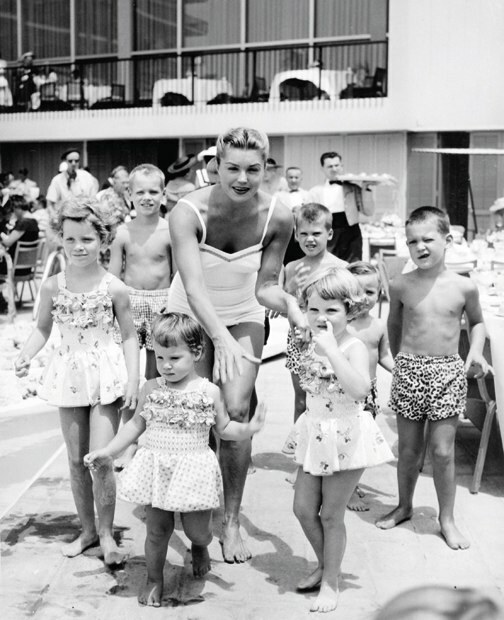 So it would take quite a few cases of ivory gardenias to fill the hotel’s cerulean pond, a 50-by-90-foot expanse shaded by palm trees, for its inauguration splash before invited guests and the press that sunny August day in 1955. This was one more photo op that busy opening season for the Hilton, and it had to wow the many, many well-wishers seated poolside, shaded by their platter-sized hats and angular sunglasses. Parting the perfumed waters with a poised dive for the cameras was the million-dollar mermaid herself, Esther Williams. R.I.P. Ms. Williams. You were and will always be in a class of your own.